Are you looking at nurse residency programs in California? If so, you need to do research into the different residencies before you select one. This way, you’ll make certain that the program you’ve selected is the one that can offer you the most. You want to be sure you’re going to be a good fit in the program and that you’ll be able to learn what you need to for your career in nursing. California has a lot of different residencies, so research is a necessity. Also, you have to remember about writing your sample letter of intent residency for the application. You also need to look at what else these residencies need for admission. If you don’t have what you need to be eligible, you may have to look for a different program. You also have to consider your admissions application and personal statement. Without a great personal statement, you may not have the edge you need to beat out all of the other nurses who have applied for that residency. We can assist you with all of your personal statement needs once you’ve decided on the residency you want to apply for. While each of the nurse residency programs in California does have slightly different admission requirements, most of them do have a number of common points you’ll need to meet in order to be eligible to apply. You will need to have completed your Bachelors of Science in Nursing (BSN) degree. You can’t apply for your residency until after you’ve graduated. Check out our personal statement for nursing school examples and discover all you need to know about writing perfect personal statement! Your nursing degree does need to come from a college or university that is fully accredited. This accreditation has to come from either the Commission on Collegiate Nursing Education (CCNE) or from the National League for Nursing Accrediting Commission (NCNAC). Degrees that do not come from an accredited program may not be eligible for a residency. Most programs also require you to have your RN license in the state the program is located in. This means you will have to take the National Council Licensure Examination (NCLEX) exam and pass it before you start your residency. Note that there are some programs that you can apply to before you take the NCLEX, but you must take the exam before your start date. Others may require you to be a full RN before you apply. If you passed your NCLEX in another state, you will need to transfer your license to California before starting your residency. Again, you may need to do this before you apply for some programs. Others may allow you to transfer your license in between applying and starting the residency. Check with the particular residency you’re applying to in order to see what is required. For those in a state that is a part of the Nurse Licensure Compact, transferring your license is fairly easy. You can even practice nursing in another state for between 30 and 90 days. However, most residencies require you to fully transfer your license before you begin. Another thing to note is that residencies are generally paid jobs. One requirement some residencies have, especially those aimed at new RNs, is that the residency is your first paid job as a nurse. If you have worked full-time as an RN before, you may not be eligible. Some do allow you to have worked as a nurse as long as it was for less than a year. Often jobs that you held before you completed your RN, even those related to nursing, do not make you ineligible. If you’ve worked in the nursing field, make certain you check the residency requirements regarding employment. Remember that while these requirements are fairly common for residencies, each program may have its own. Make sure you research the program fully to see what it requires before applying. Most residency programs do require you to submit a number of documents when you apply. Just like the requirements, the documents you need to submit may vary, but most residencies have several common items you’ll need to submit. Always check the residency requirements to make sure you have all of the documents required before you submit your application. Residencies usually have an application form for you to complete. These forms used to be paper copies you would have to fill out and either mail or fax back, but today, many are done online. You will need to attach or copy and paste in your answers. This includes answers to a number of different questions and a copy of your personal statement. This statement may be several pages long and is where you state why you’ve gone into nursing, what you think the residency can do for you, and why you should be accepted. Each residency may ask for slightly different information in your personal statement, so you’re likely going to need to write or revise your essay for each application. You may need to discuss your passion for nursing, what you want from your career, and what you’ve experienced as a nurse that has influenced how you practice. There can be a number of different questions on these applications, and some may have more than others. Feel free to check out Stanford Nursing Program requirements and tips! You may need to submit a cover letter in addition to your application. Some online applications do not have a space for this, which means they do not want one. However, if you’re mailing in a paper copy, you should include a cover letter that states who you are, why you’re applying, and provides a short summary of your qualifications. It shouldn’t be exactly the same as your personal statement, but you can summarize that essay. If you’re emailing your application, you can include your cover letter in the body of the email. Most applications also ask for your school transcripts and your resume. Some programs will want transcripts that cover your entire college career, while others only want to see information regarding your nursing courses. There are a number of different residencies in California you can apply for. If you search for a list of nursing schools in California, you’ll find many include residencies that are nearby. Here are five of the best nursing residencies in the state. Cedars-Sinai. This program is one of the top residencies in Los Angeles. The American Nurses Credentialing Center has named it a Magnet program four times. It is one of the best programs to apply to, but that means competition is very fierce. Only the top nurses are accepted. Children’s Hospital Los Angeles. For those who want to specialize in pediatrics, this is an excellent program. It offers 22 weeks of intensive clinicals and experience. However, those who aren’t interested in working with children won’t find this program to be that helpful. UCLA Health. This program offers different types of residencies and programs, including a summer program. The residency program has two acceptance periods, which is a pro for those who may not be able to meet the start date of other residencies. However, because of its prestige, both of these programs are very competitive. Scripps Health. Located in San Diego, this program pairs new nurses with seasoned mentors who can assist them with transitioning from a nursing student into an experienced caregiver. Residents do work one on one with experienced nurses and may work in a number of different areas. However, unlike some programs, these residencies are less than a year long. UC Davis Health System. This residency program is located in Sacramento. It offers four different start dates but only one admission period, which means if you miss that deadline, you must wait a year. The program is a year long, however, and prepares residents to become general nurses. What Should You Pay Attention to When Choosing a Residency? When you’re looking at a residency, there are some things you need to pay close attention to. Graduates from any of the University of California nursing programs may plan to stay in the state, but those who are moving from other locations will want to look at the cost of living. California is expensive, and while residencies do pay, a new nurse may need to have a roommate or live in one of the cheaper areas. Another thing to pay attention to include the deadlines and start dates of the residency. If you miss the deadline or can’t start when the program does, you may have to wait a year. Be sure you know how long the program is and what your requirements will be. Look for a residency that focuses on the area of nursing you want to specialize in. Read online reviews of different residencies to see what nurses experienced. Does the program offer one-on-one mentorships? How much does the residency pay? If you’re looking for new graduate RN programs California does have a number of newer residencies. While newer residencies aren’t necessarily better, they may have less competition. There are a number of different hospitals in the state offering new graduate residencies. Nursing schools in California have increased from 97 in 2001 to more than 135. The number of nurses graduating in California has doubled from 2001 to 2009. The number has increased from 5,000 to more than 10,500. California is one of ten states that projections show will train about half of the nurses needed in the U.S. If you’re ready to apply for one of the nurse residency programs in California, it’s time to get started on your personal statement. Not everyone has the ability to write exactly what they want to say, or simply for lack of time, organize their thoughts in a logical way for writing strong papers for applying to nurse residency programs in California. In such a situation, it is obvious to start to seek for professional help to boost your chances of getting the desired fellowship. Our residency personal statement writing services are here to help you write a great personal statement that reflects who you are and why you love nursing. We are a team of experts who will provide you with full support in preparing your documents, from personal statement to letter of recommendation for residency, just see our sample letter of recommendation for residency to learn more. We will help you to move forward with your personal goals! 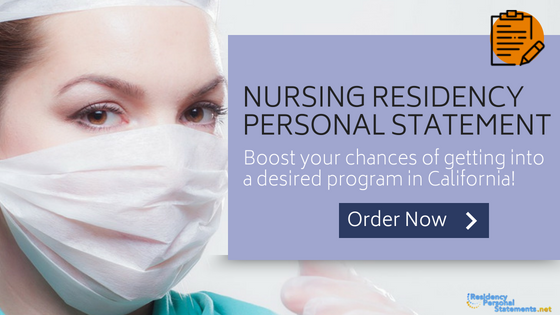 Contact us today and rest assured to get a perfect personal statement for nurse residency programs in California! Get most out of our residency personal statement service right away!